While the alleged annual apparition of John ‘Auld Staney Breeks’ Cowane at Cowane’s Hospital each Hallowe’en almost certainly owes more to bottled spirits than any ethereal energies you may care to imagine, his estate may have a connection to more recent ghostly goings-on in the Old Town – within the walls of his former home, in fact: the ruinous Cowane’s House, in St Mary’s Wynd. It was known for many years to locals as ‘Queen Mary’s Palace’, though the building has absolutely no (known) connection with the notorious Queen of Scots, though it may – according to the researches of the Reverend Charles Rogers, who masterminded the campaign to build the National Wallace Monument - have been leased at one time to James Douglas,4th Earl of Morton, fourth Regent to Mary’s heir, James VI: a writ relating to a neighbouring property a decade earlier declares the site as ‘the land of the deceased John Cowane’ - the more famous John’s grandfather, who built the property. By the start of the 17th-century it was again home to the Merchants– a dormer decoration in the courtyard, ‘IC/AC 1633’, commemorating an expansion of the mansion when occupied by ‘Staney-Breeks’ and his sister Agnes. In later years it served as the workshop of Messrs Scott and Gilfinnan’s Carpet House Company, and (twice) as a school – offering accommodation for its Masters in the Cowanes’ old chambers. 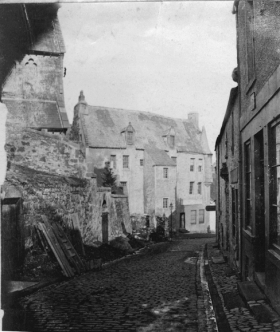 It's pictured here (right) in 1870, still occupied - the ground floor used as a bakers' shop! Falling into disrepair in the late 1800s it was unroofed by the Town Council at the start of the 20th-century, in the hope that it would fall down and save the Burgh the cost of demolition. With typical Cowane stubbornness, it remains standing! Despite its imposing appearance and colourful history, it is perhaps surprising that it is one of the few buildings of great vintage within the Old Town with no notable ghostly legends attributed to it – save, of course, for warnings that a baby’s wail can be heard from the fetid depths of the court-yard Well, luring inquisitive tykes to peer too far over the edge, and fall in...though this is (like the legend of Jock Rankin and Hangman’s Close, detailed elsewhere in 'Fact & Fiction') a tall tale devised by parents eager to discourage their offspring from playing in the dangerous ruin. Still, it looks the part. Every inch the forbidding ‘haunted house’: a rough-hewn high-walled huddle where even the greatest sceptic might feel unnerved by unseen dangers lurking in the shifting shadows. 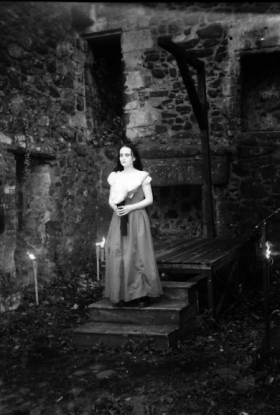 The gloriously grim appearance of Cowane’s House is, after all, why it is so often used as the dramatic back-drop for the finale of the Stirling GhostWalk. One drear, dark night in November 2007 the Happy Hangman, David Kinnaird, was engaged to lead a group of Edinburgh-based Mediums around the Old Town. For once, though, he was not in costume, and Master Rankin’s noose and tricorn were left at home. David had a simple brief – to lead them to sites of alleged supernatural activity, allow these Sensitives to present their spiritual insights and impressions – and, as an authority on local lore, provide them with information concerning the history and folklore of the sites selected. To prevent ‘cribbing’ in advance, the Mediums were under the impression that they were to be visiting Perth...so Stirling’s supposedly haunted places were a surprise to them. 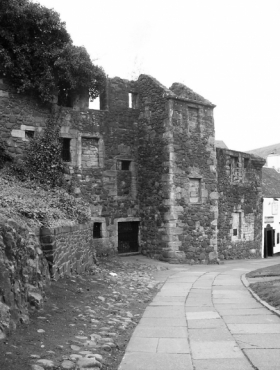 The group were led around the Burgh’s ‘Most Haunted’ sites - the Tolbooth, Mar’s Wark and Cowane’s Hospital. David – a sceptic at heart, despite his fascination with local lore and legend - was keen to test how suggestible these so-called Sensitives might really be . Though its only known ghost-story (the weeping baby) was a feeble fiction, he was eager to see if Cowane’s House would ‘spook’ the psychics as it had so many of his audiences. 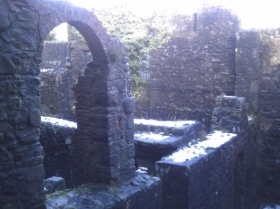 With these thoughts in mind, the actor unlocked the ruin’s rusted metal gate and bid his spirited companions enter. Most did not wish to linger long – though, truth be told, that probably owed more to the bitterly cold winter wind than to any sense of psychic dread. The proximity of a different kind of spirit – a warming dram in Whistlebinkies pub, next door - may also have been a factor! Only one gentleman in the party reported any odd sensations – other than the cold, that is. Standing in the gardens behind the courtyard he became suddenly nauseous. He couldn’t breathe, he said. His head was reeling and he felt depressed, dizzy and disorientated. In a moment he could not speak – saying, later, that he felt a constriction in his throat. Concerned, David led the group back outside, and all distress quickly passed. The actor thought to dismiss the medium’s reaction to an over-active imagination, and to that peculiarly selective claustrophobia so often experienced by imaginative night-visitors to buildings which they believe to be haunted. After all, in all his experiences of the old place, the medium’s reaction was unique. Only later, looking over the many impressions reported by the group during those few short hours, did he give the matter of the choking medium further thought. Why such an extreme response, and why there, in that calm and leafy garden? Historically, two incidents in the history of Cowane’s House presented themselves. Were the Reverend Rogers theories regarding residence there by the Regent Morton accurate, in the late 16th-century, then there might be what Fleming terms a ‘tragic interest’ to the psychic’s experience, as it would have been in the banqueting hall which once occupied those same overgrown gardens that John Stewart, Lord Chancellor of Scotland - who had foolishly joked of his host’s involvement in the murder of young King James’s father, Lord Darnley - was poisoned, in April 1579...choking to death as the Regent watched. A more recent sad incident also sprang to mind. In the 1980s a local Prison Officer, a troubled soul, stricken by the ‘Black Dog’ of depression had clambered into the long-abandoned gardens to the rear of Cowane’s House by night, intent upon taking his own life. In despair, he tied a cord to a high branch, coiled the other end about his throat, and jumped. He slowly strangled: his rope and the wall both too short for the drop to snap his neck. Poor soul. Unable to breathe; disorientated, depressed and confused. Exactly the sensations reported by the distressed medium. Probably, even – we can never underestimate the suggestibility of the human mind, after all, or it’s tendency to make links and patterns from the most random of events. Intriguing though, don’t you think?